Horizontal or vertical splitting or cracking of fiberglass shingles has been a concern in the roofing industry over recent years. Following complaints from roofing contractors, studies done by the Western States Roofing Contractors Association in 1992 and 1995 showed that asphalt fiberglass shingles, particularly the 20-year guaranteed shingles, were failing prematurely, some as early as six months, with average failures occurring at about five years. A copy of the reports may be ordered through WSRCA’ website at http://www.wsrca.com. 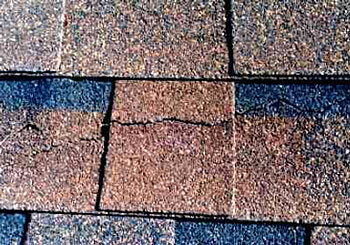 Although specific causes are not discussed in the WSRCA report, failures are reportedly due to a number of things including low-strength glass mat reinforcement coupled with seal strips that are too tenacious, too high an asphalt filler content, or failure to properly blend the asphalt saturants used in the manufacture of the shingles. There are currently two material specification standards that apply to fiberglass shingles: ASTM Standard D3018 and ASTM Standard D3462, both of which are available at http://www.astm.org. ASTM D3018 includes tests for volatile loss and granule surface sliding, fire test classification and wind resistance. ASTM D3462 is more stringent in that it incorporates these tests and also includes tests for tear strength, asphalt penetration, softening point and compatibility, mass, granule displacement, and fastener pull-through resistance. Tear strength values are important because they measure the shingles’ “toughness” or resistance to tearing and splitting as a result of movements by building expansion and construction, fasteners, loads and wind. Tear strength is also critical in determining shingles’ resistance to “blow-offs”. According to the National Roofing Contractors Association, shingles complying with ASTM D3462 do not dominate the market, however. Of the 122 fiberglass shingle products listed in the 1998 edition of NRCA’s “Residential Steep-Slope Roofing Materials Guide”, only 79 fiberglass shingle products listed comply with ASTM D3462. 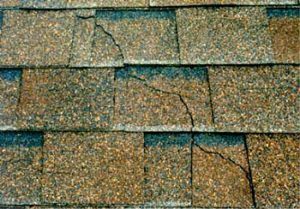 Generally, most fiberglass shingles labeled “20-year” and some “25-year” or higher do not comply with ASTM D3462. A current listing of manufacturers whose products comply with the standard may be found at http://www.nrca.net. Model codes such as BOCA (Building Officials and Code Administrators) and SBCCI (Standard Building Code) reference ASTM D3462 as a minimum material requirement for fiberglass shingles. The UBC (Uniform Building Code), which is used in the western 2/3 of the United States, does not. Thus, the sale and use of shingles not complying with the standard are violations of the building code provisions in those areas where BOCA or SBCCI are used but not where the UBC is used. The proposed International Code 2000, if adopted in its current form, would correct the disparity by referencing the standard as a minimum requirement for all asphalt shingles. In the meantime, roofing specification writers should be cautious and be aware that not all asphalt fiberglass shingles are created equal and that stated warranties should not be regarded as insurance policies.